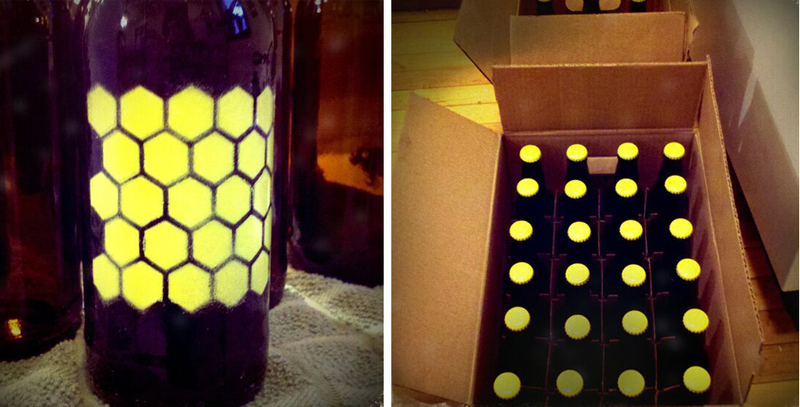 Not Your Honey became my Valentine’s or "Anti-Valentines" concept beer at the end of January. 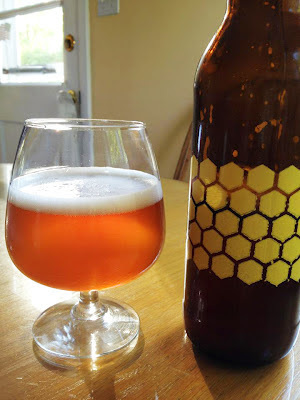 I wanted to try brewing with local honey as well as try a lighter style of beer. A subtle hint of ginger seemed like an appropriate flavor combination as well as a tie in to the name. Sweet with a bite to the tongue just when you thought you knew what you were in for. I had heard talk of darker beers being easier to brew and I found this to be true based on my singular experience. The Witbier was wheat flake based and those grains compared to malt barley were much more sensitive and easy to over cook. The steeping process took much longer because I had to constantly monitor the temperature and lower/raise appropriately to make sure it didn’t rise above 160. I started with a Brewer’s Best Witbier base, adding 1 lb of raw unfiltered wildflower honey, coriander, orange peel and dried ginger. I had researched ginger and was a bit terrified of the potency of fresh ginger on a small batch. I felt like I had more control adding ginger powder in the primary and tasting/adjusting before secondary. 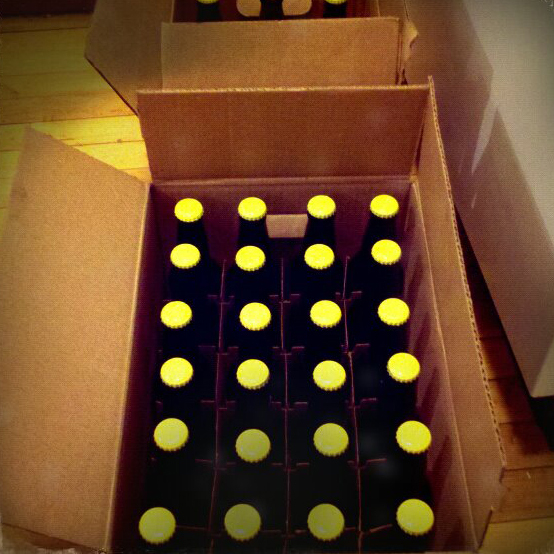 I followed the same schedule here - 1 week in primary, 2 in secondary and a month in bottle fermentation. I was really happy how this one turned out. The color was absolutely gorgeous. Much deeper than I expected. It has a wonderful honey aroma, a quick bite on the tip of your tongue from the ginger followed by a smooth sweetness from the honey. Very well carbonated. The honey didn’t boost the ABV as much as I’d hoped, but there’s always next time! 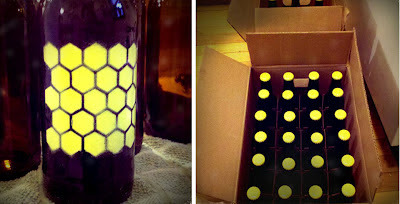 For labeling I had been inspired by some of the screen printed bottles I had seen. New Belgium Lips Of Faith is a great example. It turns out this is a much more difficult concept than first appeared. Screen printing is tricky on glass and even more so on a curved surface, since most silk screens are in rectangular flat frames. I decided to attempt spray painting through a stencil to achieve an urban feel. I was able to find a fantastic woman, Joanie at Creative Stencil Designs who created a custom sized honeycomb pattern made from a laser cut mylar sheet. I used Rust-oleum Painter's Touch Ultra 2x coverage paint, applying thin coats. It was a tricky and time consuming process, which wasn't perfect, but still came out pretty cool looking as a concept.